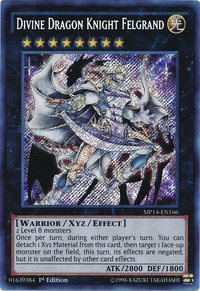 The silhouette of Felgrand Dragon appears in this card's artwork. This monster's armor also resembles the aforementioned monster. 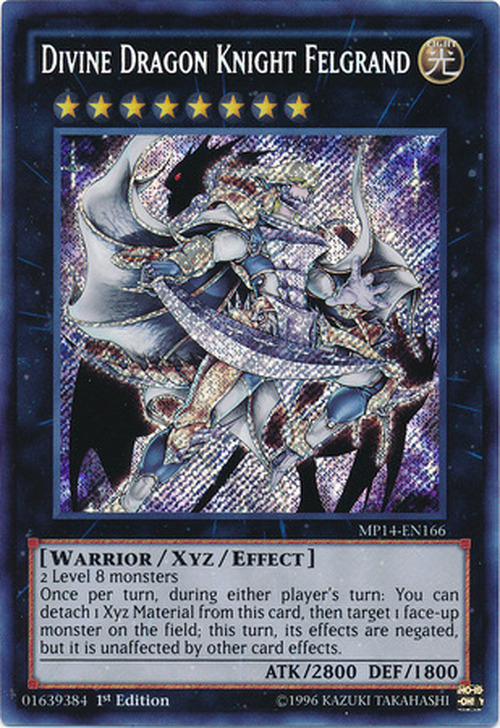 This monster's sword has 8 stars along the back of the blade which is equal to its Rank (and the Level of the required Xyz Materials). This monster appears to be an upgraded/older form of Paladin of Felgrand. This is supported my a similar hair color, as well as this monster's sword also being wielded by Paladin, and Paladin's armor being a less bulky version of this monster's. This effect can also target this card itself or a face-up monster your opponent controls. Detaching 1 Xyz Material is a cost to activate this effect. This effect cannot be activated during the Damage Step.